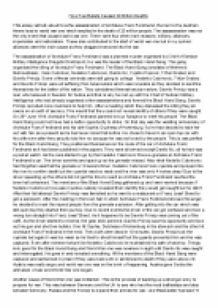 ï»¿How Two Bullets Caused 20 Million Deaths This essay will talk about how the assassination of Archduke Franz Ferdinand, the heir to the Austrian throne lead to world war one which resulted in the death of 20 million people. The assassination was not the only event that caused world war one. There were four other main reasons: military, alliances, imperialism and nationalism. These also contributed to the start of world war one but in my opinion alliances were the main cause as they dragged everyone into the war. The assassination of Archduke Franz Ferdinand was a planned murder organised by Chief of Serbian Military Intelligence Dragutin DimitrijeviÄ. He was the leader of the Black Hand Gang. This gang organised the killing of Archduke Franz Ferdinand. The Black Hand Gang consisted of Mehmed Mehmedbasic, Vaso Cubrilovic, Nedelko Cabrinovic, Danilo Ilic, Cvjetko Popovic, Trifun Grabez and Gavrilo Princip. Some of these criminals were still going to college. Nedelko Cabrinovic, Trifun Grabez and Gavrilo Princip were all suffering from tuberculosis which was incurable so they decided to sacrifice themselves for the better of the nation. They considered themselves as martyrs. Gavrilo Princip was a man who believed in freedom for Serbia and that is why he met up with the Chief of Serbian Military Intelligence who had already organised a few assassinations and formed the Black Hand Gang. ...read more. This belief led to an arms race in Europe, which was when the countries were making more deadly weapons than their rival nations; Germany challenged Britain?s supremacy at sea by building submarines. Britain was an island nation and thus wanted to rule the waves. Militarism leads to suspicion and thus it was one of the causes. So after the assassination of Archduke Franz Ferdinand, it became and excuse and the World War one started. Militarism worked hand in hand with imperialism which was another main cause of the World War one. Imperialism is when a country takes over another country economically or politically. This was another cause was that European nations ruled smaller countries, called colonies, and competed with each other to amass more colonies. Gathering colonies became known as Imperialism. Both France and Britain had many colonies in Africa and Asia. France and England had acquired colonies which created much wealth for the mother country by the turn of the century. Colonies or areas under control or influence by the major powers provided wealth in the form of resources, markets, and military advantages. Now Germany and Italy decided they wanted a colonial empire too. They were jealous of the countries that had other places where they could gather raw materials and cheap labour. ...read more. Mobilization was considered as act of war. Germany declared war on Russia and then Germany declared war on France. German troops poured into Belgium as directed under the Schlieffen Plan, drawn up in 1905. The British foreign secretary, Sir Edward Grey, sent an ultimatum to Germany demanding their withdrawal from the neutral Belgium as they had an alliance with Belgium. Germany did not withdraw from Belgium and on 4th August 1914 Britain declared war on Germany. With Britain's entry into the war, her colonies and dominions abroad variously offered military and financial assistance, and included Australia, Canada, India, New Zealand and South Africa. Japan declared war on Germany through its alliance with Great Britain, signed in 1902. Austria-Hungary responded by declaring war on Japan. Turkey extended help to German naval bombardment of Russia. As the Turks helped Germany, Russia declared War on Turkey. Britain and France, Russia's allies, declared war on Turkey, because of the help given to the German attack on Russia. In conclusion I would like to say that the war had more than one cause. The long term causes were the military build-up, the imperialism and the nationalism. 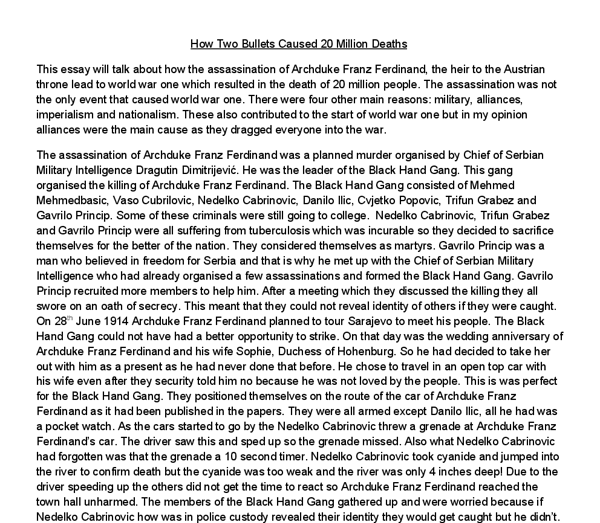 The short term causes were the alliances and the trigger cause was the assassination of Archduke Franz Ferdinand. In my opinion I think the alliances were the major cause as they dragged everyone into war just because one country went into war so if it was not for the alliances then the war would not have occurred. ...read more. Austrian Hungarians, leaving Austria to fight a war on the Russian and Serbian flanks. So Austria Hungary did not at first invade Serbia. On the 28th June, 1914, Gavrilo Princip, a member of the Black Hand Gang, a nationalist Slav terrorist group shot the heir to the throne of Austria Hungary, Franz Ferdinand, twice with a pistol. Most of Bismarck's political energy had been aimed at not so much finding allies for Germany but in avoiding having a combination of enemies facing her. He considered that this was most effectively achieved by creating mutual aversions amongst the other powers. What were the purposes of the Triple Alliance? Fundamentally, it was the major move in Bismarck's game to maintain the peace of Europe. In 1872 Lord Odo Russell, the British Ambassador in Berlin, had informed the Foreign Office that Bismarck's policy was "the supremacy of Germany in Europe and of the German race in the world." Also, because of the belief that they should be the superior ruling country in Europe and beyond, Germany looked to other regions of the world, such as Africa, where it believed it had rights to take over land and resources. WW1-planning for war, major battles. War at sea and in the air. This part of Medieval heritage was unrecognizable from then on. The Second Battle of Ypres (April-May 1915) Germanys attempts to capture Ypres and the seaports beyond. This was the first battle where gas was used and it was used by the Germans. Meanwhile France has been fighting with Prussia (German state) and lost Alsace-Lorraine, a wealthy town with a varied range of abundant resources, and wants revenge. France is also in league with Britain and later is thinking about using the sheer size of the British Navy to it's own advantage.